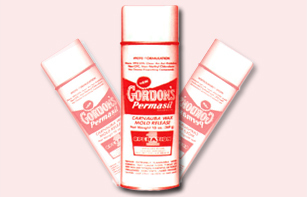 ﻿ Carnauba Wax Molding Release - 808 Formula - 909C Formulation - 909D Formulation :: M.J. Gordon Company -- The aerosol mold release specialists. NOTE: Refer to Section 8 for content breakdown and SARA TITLE III information. I. Appearance and Odor: CONCENTRATE: Clear liquid with characteristic odor. Dry Chemical, foam, carbon dioxide. Water may be used to cool closed containers to avoid pressure build up and possible bursting when exposed to high temperatures. Firemen should wear self-contained respiratory protection. Hazardous decomposition products. EXTREMELY FLAMMABLE. Contents under pressure. Do not use or store near heat or ignition sources. Containers may burst at temperatures above 130° F.
Avoid any ignition source. Avoid excessive heat. ignition sources, open flames, or other high temperatures which induce thermal decomposition. Will not occur. Conditions to avoid not applicable. INHALATION: Excessive inhalation of vapors can cause irritation, dizziness, weakness, fatigue, nausea, headache,possible unconsciousness, and even asphyxiation. Overexposure may cause damage to the nervous system. INGESTION: If aspirated (liquid enters the lungs), it may be rapidly absorbed through the lungs and result in injury to other bodily systems. IMPORTANT NOTICE: REPEATED AND PROLONGED OVEREXPOSURE TO SOLVENTS MAY LEAD TO PERMANENT BRAIN AND NERVOUS SYSTEM DAMAGE. EYE WATERING, HEADACHES, NAUSEA, DIZZINESS, AND LOSS OF COORDINATION ARE SIGNS THAT SOLVENT LEVELS ARE TOO HIGH. INTENTIONAL MISUSE BY DELIBERATELY CONCENTRATING AND INHALING MAY BE HARMFUL OR FATAL. INHALATION: Remove to fresh air. If not breathing, give mouth-tomouth resuscitation. If breathing is difficult, give oxygen. Do not give epinephrine or similar drugs. Call a physician. EYES: Flush with flowing water immediately and continuously for 15 minutes. Consult medical personnel. SKIN: Wash off in flowing water or shower. Remove contaminated clothing and wash before reuse. INGESTIONS: Do not induce vomiting. Call a physician immediately. NIOSH or Bureau of Mines approved organic vapor-type respirator is required in absence of proper environmental control. Solvent resistant gloves; impervious gloves. Do not store above 120°F. Avoid breathing vapors. Vapors are heavier than air and will collect in low areas. Avoid prolonged or repeated contact with skin. Do not store near open flames or any other ignition source. EXTREMELY FLAMMABLE. Contents under pressure. Do not puncture or incinerate. Avoid skin contact. SMALL SPILLS: Remove ignition sources. Mop up, wipe up, or soak up immediately. Use proper protective equipment. LARGE SPILLS: Evacuate area. Remove ignition sources. Contain liquid; transfer to closed containers; keep out of water supplies. Dispose in accordance with Federal, State, and local regulations. Do not incinerate closed or empty containers. These chemicals are reported on the United States Environmental Protection Agency TOXIC SUBSTANCES CONTROL ACT INVENTORY (TSCA). THE INFORMATION HEREIN IS GIVEN IN GOOD FAITH, BUT NO WARRANTY, EXPRESS OR IMPLIED IS MADE.